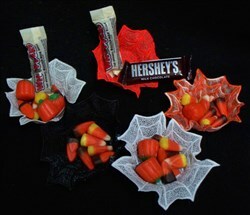 I'm a Halloween person and these candy cups are the cutest. I made them for my girl friends and they loved them. Very cute. Hard to form on muffin tins, but made it work. Love the design, it sewed out beautifully. stitches out great! a fun idea for small treats. Could be bigger though, I enlarged on my machine but haven't stitched out yet. Making these for my granddaughters preK3 class. So cute. Ramona Baird is happy to present FSL Spider Web Candy Cup machine embroidery design which has 28083 stitches and is [123.70 mm x 130.56 mm] large. If you would like to view more embroidery patterns please search on our embroidery designs page.